The first step in such a project would be to gather as much relevant data as is available from this period. These data could be in the form of architectural plans containing details of the modifications made to the Basilica, specific music scores composed keeping in mind the effects of architecture on the clarity and resonance of music within the Basilica, and details about the specific placement of musicians and spectators within San Marco. There are also accounts of changes being made to accommodate very specific situations – in one such case, a newly elected Doge (the leading spiritual and political entity in Venice) was unable to climb up to the usual place reserved for persons of his stature, due to reasons of excessive obesity . Thus, the arrangement of a big chunk of the musical ensemble playing at the Basilica had to change so that the Doge would continue receiving very clear, non-echoing music. As one can see, the level of complexity involved is quite high and one would need substantial data from books, papers, journals and possibly private accounts that were published on the architecture and acoustics at San Marco, especially relevant to the collaboration between Jacopo Sansovino and Adrian Willaert. One such resource is Architectural Spaces for Music: Jacopo Sansovino and Adrian Willaert at St. Mark’s by Laura Moretti (2004) . Using the plans of the aforementioned architectural modifications, our goal is to be able to construct a two-dimensional model of the Basilica at several time points within the study period, and later extend it to three dimensions, given enough time and/or knowledge. Acoustic simulations will then be carried out within the confines of this 2D model. The aim of doing this is to map the changes in composition style (such as Willaert’s introduction of a poly-choir in the Basilica or introduction of new instruments) and performance style (the placement of musicians within the Basilica and the difference in sound reception at various locations). This will enable us to understand the types of sounds we are looking to simulate and identify the locations of special importance from an audience perspective (such as the seating location of the Doge, the nave, etc…). Some sources for obtaining such information are Performance in San Marco: a picture and two puzzles by Frederick Hammond (2012)  or Bassano and the Orchestra of St. Mark’s by Eleanor Selfridge-Field (1976) . This knowledge will be crucial to define the context of the acoustic simulations. 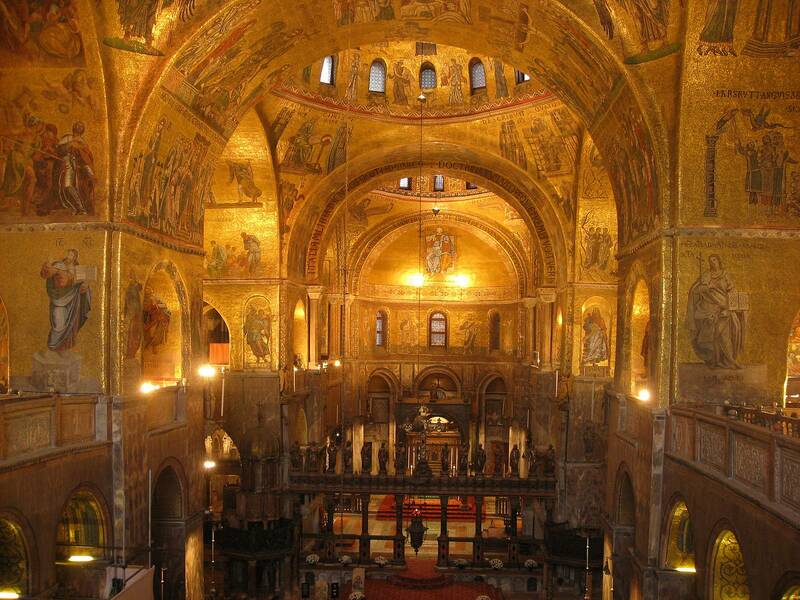 The third part of the project would then be to build a simulation model to study the acoustics of the Basilica and its evolution throughout the study period. The principle is the following: a sound that is emitted at a specific point in the Basilica will see its time-composition and/or frequency-composition change because of multiple reflections and absorptions on the walls and ceiling of the church before it reaches a certain reception point. The idea is to recreate the sound received at the previously identified locations in the Basilica for a given emission point. This could be done using acoustic signal-processing software such as Acoustica or Audacity. Such simulation has already been performed, as described for instance in Acoustic Simulation of Renaissance Venetian Churches by Braxton Boren (2013) . 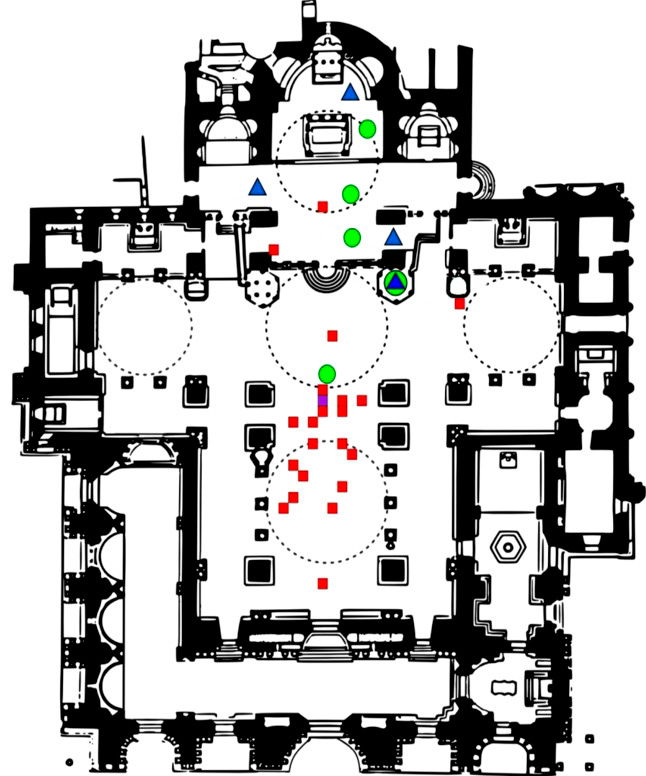 To check if the designed model is working properly, a first test could be performed in a church in Lausanne by comparing for a given emission point the signals computed by the model with the signals actually recorded at several places in the church. If the model seems correct, the next step would be to extend it to an emission signal consisting of sounds coming from several different points, in order to simulate an orchestra playing at San Marco. This would enable us to assess the quality of the music that was heard at the previously identified locations, especially whether there is a lot of echo and whether the different instruments playing are perceived as synchronized. 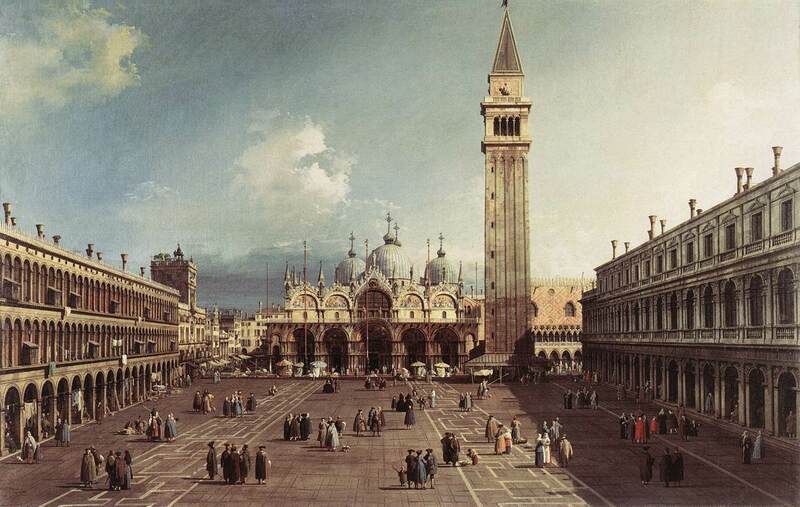 The idea is to design a very interactive deliverable: one would be able to select the number of musicians, the places from which they would play as well as the locations of the spectators, in order to get a better idea of how music at San Marco sounded like in the 16th century and where the best places to capture all its beauty were.